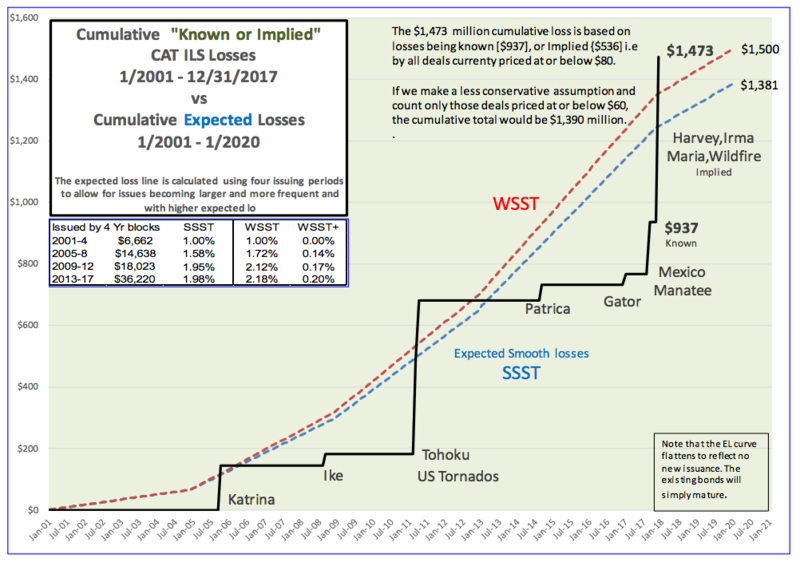 The final terms of reinsurance contracts due to incept on January 1 kept everyone guessing until the final days of 2017. In the end, the price rises predicted by many reinsurance CEOs proved to be over optimistic as their underwriters were unable to resist the pressure from the supply/demand imbalance caused by continuing capital inflows. Despite some extreme volatility in quoting behaviour clients and carriers found common ground very late in the 1/1/18 renewal process. We saw some churn in cedant and market appetite and some tweaking of structures but limits bound were, in the end, commensurate with the same period last year. It was initially difficult to determine trends in pricing but it appears to have settled between +5% and +10% across all non loss impacted policies (a little more for US specific coverages) with something more in a range of +15% to +25% where recoveries had been made in 2017. The ILS community dominate the list of 1/1 buyers yet again with the bulk of trading concentrated around 10% rate on line and under. Users who have registered (for free) can see the interactive version of this chart here. 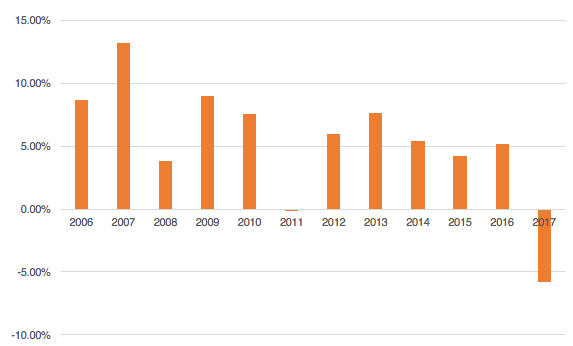 The chart above shows the annual returns of the Eureakhedge index (using provisional results for December 2017). 2017 is set to be the worst performing year of the last 12 years. The diverse strategies of the funds has meant that the year has seen a wide variation in the performance of individual funds. The losses have not deterred investors and most of the large, incumbent ILS funds have had little difficulty raising new capital. For example, in the 12 months to October 2017 Stone Ridge grew the AUM of its two reinsurance funds by over $1 billion to more than $6 billion and 'enabled $1 billion' of payments for the Atlantic hurricanes and Californian wildfires. Also notable was the Class of 2017 reinsurance startups which saw a glut of new (smaller) reinsurance platforms being established using a wide variety of structures in various jurisdictions. 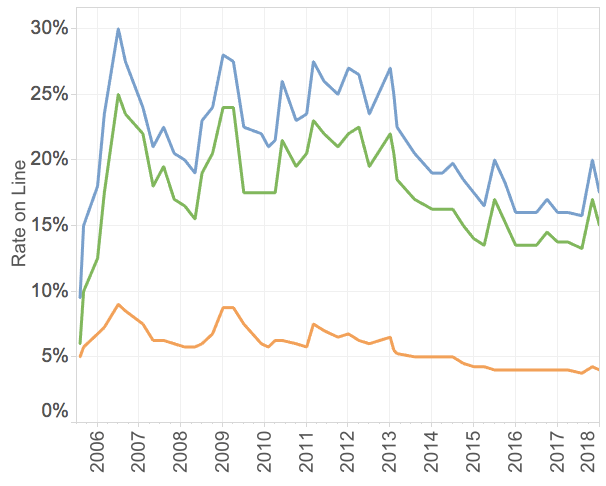 An update of a study by Lane Financial indicates that, over the last 17 years, the total losses in the catastrophe bond market has been consistent with the total defaults predicted by the modelling agencies. 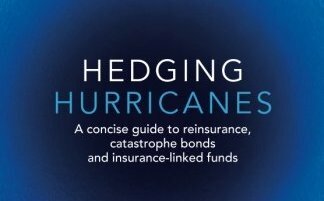 Hedging Hurricanes - a concise guide to reinsurance, catastrophe bonds and insurance linked funds is now available in print and on Kindle.